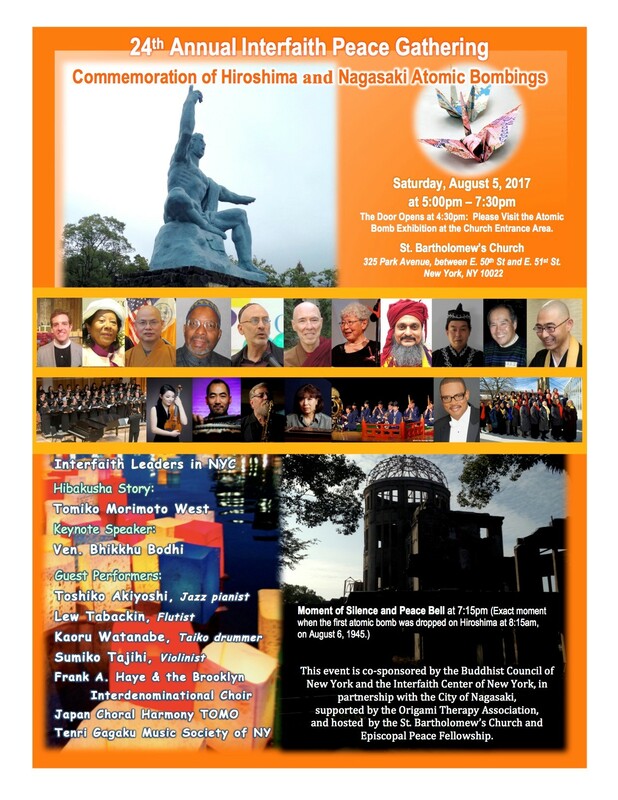 Manhattan, New York – Please join us for the 24rd Annual Interfaith Peace Ceremony to commemorate the Hiroshima and Nagasaki atomic bombings. The event will be held at St. Bartholomew’s Church (St. Bart’s Church) on 325 Park Avenue, 5:00pm – 7:30pm. Rev. Dr. T. Kenjitsu Nakagaki, a Japanese Buddhist priest, Hiroshima Peace Ambassador, Peace Correspondent of Nagasaki, President of the Buddhist Council of New York and former Vice President of the Interfaith Center of New York, has organized this Annual Interfaith Peace Gathering since 1994. This commemorative ceremony will include local Buddhist, Shinto, Christian, Jewish, Hindu, Muslim and Native American religious leaders, along with musicians and choirs from Japan and the United States. Messages from the Mayors of Hiroshima and Nagasaki will be read by representatives from associations of local NYC Japanese residents who originally hail from Hiroshima and Nagasaki. Hiroshima survivor Tomiko Morimoto West will share her story. The keynote address will be presented by Venerable Bhikkhu Bodhi, a well-known American Buddhist monk who was born and raised in Brooklyn. Ven. Bodhi is known for his translations of many Buddhist scriptures into English and his social engagement on issues such as poverty, climate change and peace building. The event will feature Japanese and American musicians including Grammy nominated jazz pianist Toshiko Akiyoshi and flutist Lew Tabackin; Kaoru Watanabe, a Japanese taiko drum player; Sumiko Tajihi, violinisit; the Brooklyn Interdenominational Choir, led by Pastor Frank Haye, and Japan Choral Harmony “TOMO,” a New York based Japanese choir. At exactly 7:15 PM, the exact moment of the Hiroshima bombing, (8:15 Aug. 6th Japan time) a bell for peace will be rung. Hiroshima and Nagasaki A-bomb Photo Exhibition will be on display in the sanctuary entrance. The event will be followed by a Silent Peace Walk to Fifth Avenue.